You can find part one of this article here. 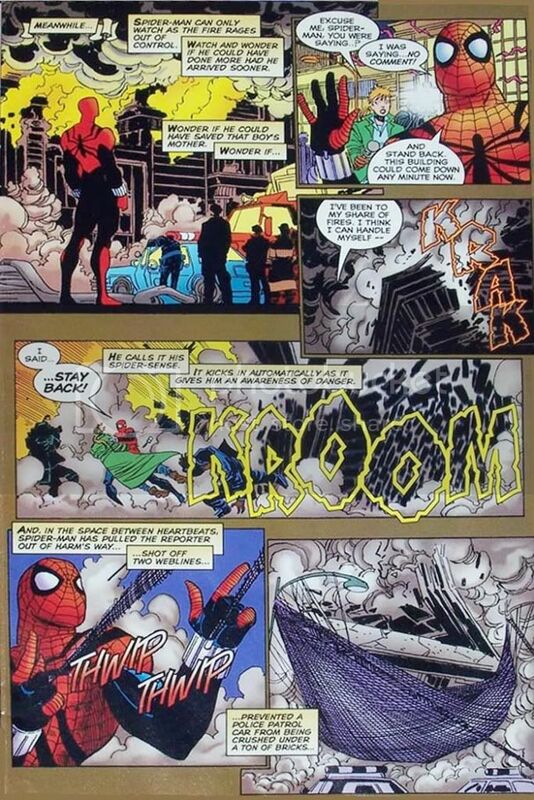 In part 1, we defined the two types of comics page layouts -- the non-bleed page and the bleed page. With examples, I've shown that they're different from each other in basic artistic respects. Here in part 2, we'll discuss more about what that means and how it affects the printing process. Some of you reading this may have encountered the concept of bleed vs. non-bleed somewhere in your artistic travels but chose to ignore the concept outright. You may be asking: So what's the big deal, really? Why can't I just draw what I want and have the publisher/printer figure it out? And the answer is pretty simple -- just not one that most people think about. American comic books are a certain, accepted shape and size when they appear on the stands at comics retail outlets. Consequently, printers print them at a standard comic book shape and size. They may vary a millimeter or two, but generally American comic books are a certain shape and size across the board. Just as an average bumper sticker is a certain size and an average postcard is a certain size. More importantly, the dimensions of comics, bumper stickers, and postcards (and other printed matter) maintain a certain accepted mathematical shape... that is, the relationship of height to width. All art must fit the intended shape. Art that is intended to be a bumper sticker must fit on a typical bumper sticker shape and size -- it can't be too wide -- or too tall -- or too short -- or too narrow... or else it won't fit right. Art intended for a bumper sticker must FIT the printed bumper sticker. Be aware that SIZE isn't the real issue -- art can be scaled up and down on a computer, but in scaling, the art must fit the intended shape. So, too, must a comic book page FIT the accepted printed shape that American comic books use. If it's too short or too narrow, your page will not fit the printed page in an eye-pleasing way. If it doesn't fit, there are two options to fix the problem. 1/ The printer must print an odd-sized publication - essentially a custom shape and size that matches the artworks' shape. This requires rearranging the machinery at the printer and it's expensive. 2/ The art will get butchered to fit the accepted standard shape. Guess which one will happen?! Publishers simply won't spend extra money because an artist wasn't paying attention. Most often, though, the art will be printed as-is -- with no fixes at all -- and with all the mistakes intact for the world to see. This results in a sloppy-looking product. Anybody planning a career as a comics artist must know their client's business -- which is printing comic books at a certain shape and size. Deliver print-ready artwork that's properly formatted and you become an asset to your editor and publisher. That's just good business sense. Now let's backtrack a bit in time. Last chapter I showed you printed examples of non-bleed and bleed pages... now let's take a look at the art board with no art drawn on it yet. Here is a photo of a sheet of DC Comics art board. This sheet is pre-printed with dotted blue lines to help guide the artist. Even though formatting instructions are printed right on the sheet, the instructions are oftentimes ignored by artists for reasons nobody really knows. For contrast, I've lined the pre-printed lines with pencil. This particular sheet was printed in 1990, but the measurements (we'll call these measurements "specs" from here on out) are pretty much the same today. This smallest box area is inset for a reason... all art confined to this box will get comfortably printed in the final book. No missing hands, no chopped off heads, no missing borders. Confine the art to this box and all your art will make it into the final printed book -- with a nice white border around it for good measure. Note that if all your art and panel borders are confined to this box, you are drawing a non-bleed page -- with the borders usually on the live area's box edge. Note also that all lettering must eventually fit inside the live area, also, so artists should not compose panels that will force the balloons outside the live area -- the letterer will just cover up that nice face that took an hour to draw. But even on a bleed page, when the art is composed, all important art (heads, hands, important props or background elements) MUST be drawn in the live area -- even if any panel bleeds in one or more directions. This is a theoretical line where the printed page gets cut in the printing process (not the original art -- the printed page at the printer). Any art past this line is considered waste -- but important waste -- that is, it's intended to get cut off in the printing process. The art past the trim line is usually background art, crowds, trees, etc. 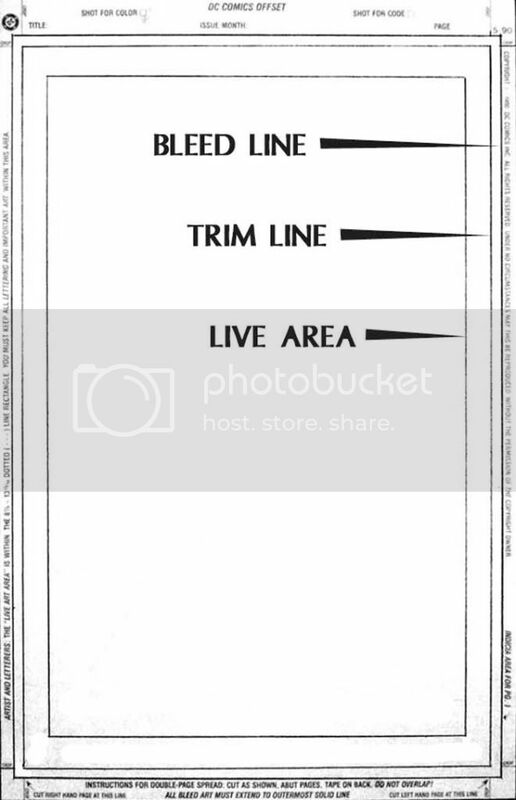 Any bleed artwork should EXTEND out from the live area, CROSS the trim line and STOP at the bleed line. This is the definition of a true bleed panel (remember, we mentioned in the last chapter that any bleed panel makes the page a bleed page! 1 bleed panel or ten -- all it takes is one bleed panel to make the page a bleed page. NEVER draw panel borders on the trim line (or between the trim line and the bleed line). The "wiggle room" between the trim line and the bleed line ensures that any bleed art is printed up to the cut edge if and when the printing plates shift during the printing process. Do yourself a favor, artists, and just ignore this line altogether... just pretend it's not there -- and don't put any borders on the trim line, either, because it's not there. But before you ignore it, consider the trim line in relation to the live area for just a moment... you can now visualize how artwork in the live area will print comfortably on the final printed page. The bleed line is the outermost box on pre-ruled art boards... this is where all bleed panel art is to stop. Remember, artwork may bleed on all four sides -- or just one side of one panel. If no panels bleed off the edge, it's a non-bleed page. DO NOT DRAW OR INK past the bleed line! And, inkers, please ink a border on the bleed line for bleed panels if the penciller has not indicated a border. I suggest all bleed lines be inked as a general rule (if the art actually goes to the line or not), though I've never actually seen it done. Doing so would greatly aid the pre-press and printing process -- so much so that all pre-ruled boards should have the bleed line printed in black rather than blue. Once again: panel borders on the live area box -- OR on the bleed line -- NEVER on the trim line. By understanding bleed vs. live area, artists can compose their pages and plan exactly how the page will print, so no surprises await them. It's professional, and it's in their best interest to create professional-looking pages if their goal is to work as a professional. Bleed books may cost more to print, so any artist desiring to draw bleed pages should consult with their client first. Small press clients, especially, like to keep costs down, so help them do that if you want to be valuable to them in the future. ASK them if you may draw full-bleed, should you desire to do so. The usual choice of unlined board is 11" by 17" bristol board with a rough finish. Check your local art supply dealer. Artists may also use the specs from Marvel board or Image board. If you have any original art from a comics pro from the past ten years, you can measure that, too. They should all be fairly close to the above DC specs. And pre-ruled art boards you buy from the comics shop are also pretty close, so they're fine to use also -- if you follow the guidelines regarding panel placement and border placement presented in the next chapter. Here's an example of a color bleed page. As you can see, the only thing that bleeds to the edge is the brown background color. This would be considered a non-bleed page from the B&W original artwork point-of-view, but a bleed page from a color and printing POV. 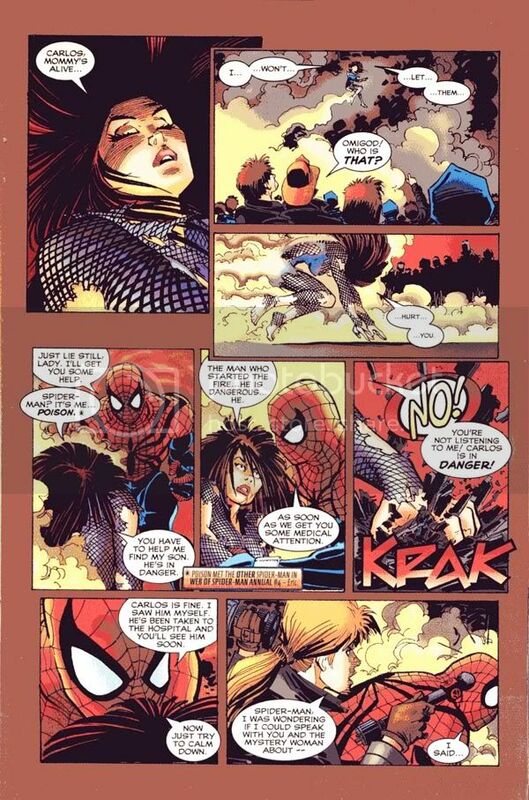 Another example below -- a bleed page... this one with design flaws. The first panel bleeds nicely at the top and left side. But panel 2's right side border is too close to the right edge. That panel should make up its mind -- is it a bleed panel or a live area panel? It's somewhere in between and this panel would look much better if that sliver of brown weren't on the right edge. That right edge border was likely drawn and inked on the trim line (no borders on the trim line!)... so what was supposed to be a bleed panel is now an inset panel -- the OPPOSITE of what the artist probably intended. Panels 4 and 5 are fine. But panel 6 bleeds off the right side, but not the bottom. Wouldn't the page have better balance overall if that panel bled off the bottom, too? Instead we get a sliver of brown at the bottom for no particular reason. This is a good example of a page that is too short and too narrow to fit on a printed bleed page. More formatting for bleed and non-bleed pages. The nitty-gritty of the dos and don'ts... with examples to guide the confused and uninitiated. Kurt Hathaway has been a comics freelancer for 25 years. His client list reads like a who's who of publishers: DC, Marvel, Image, Dark Horse, Eclipse, Malibu, and tons of others. He has thousands of lettering credits including two for Newsweek and Esquire magazines. A DC editor nicknamed him "The Comics Commando" for his timely delivery of deadline work. He letters the webcomics "Master Jesus" and "Chicago 1968" both written by Len Kody. In addition to lettering and logos, Kurt Hathaway's Cartoon Balloons Studio does custom font design, page/book/magazine design, pre-press (setting up press files for the printer), and animated motion graphics for video projects. I can't stress how important this is. I letter a lot of short stories that people intend to submit for anthologies, and I can't tell you how many times I have small panels off to the side that the main portions of the art is very close to the bleed line, and the script calls for letters in that same area, which is a no-no to get printed. It looks really bad and can cut off. Make sure the artist is aware of this article before you finish the storyboarding/layouts!